It’s not my intention here to belittle America but some of his most trenchant criticisms might well apply to Greene’s own country. To give just one example, he is critical of Russian oligarchs as if his own country doesn’t have its share of obscenely rich people while the underclass go hungry and homeless. I am not proud to say that here in Australia we do too. Obscenely rich people are a global phenomenon and so are their spawn, the hungry and the homeless. Highly visible begging used to be a third-world phenomenon but it arrived in the West with Thatcherism and Reaganomics, and it hasn’t gone away. I share Greene’s distaste for Russia’s oligarchs, but what I’m interested in is an analysis of what went wrong and how it could have been prevented: how should a country make the transition from a communist state with a managed economy to democracy and a market economy? It’s easy to be snide after the event, but the West was cheering from the sidelines when the USSR collapsed and there was little talk of slowing the pace of change to ensure that the carve-up was fair. Notice the way he slips in that sentence about the weather? Even their weather is sneaky and capricious! I have a couple of travel tips for Mr Greene: leave the car at home and take the underground trains – just as you would in any other city bedevilled by traffic problems (London, Paris, Rome, Melbourne etc.) and try turning on the TV for the weather forecast (where you might also see footage of extreme weather events in the US and elsewhere in the world). Yes, Russians do have weather forecasting. They’ve probably got climate change scientists too, warning that extreme weather events are becoming more common around the world. The Washington Post review is a little kinder than I am, calling Greene’s assumption that everyone wants to be like America naïve and a little judgmental. And it sometimes undermines the empathic voice Greene works so hard to establish. Empathetic voice? I wondered if we’d read the same book. I’m not an apologist for Russia but when I read that Russia is a country where today there is little to be proud of or believe in (p. 66) I found this an extraordinary claim to make. I asked my husband if he thought Russia had anything to be proud of. His immediate reaction was that they had made an enormous contribution to the arts – especially music and literature, and that their defeat of the Germans at Stalingrad was the turning point of the war against Hitler. Wikipedia tells us that the Soviet era for all its grave flaws saw some of the most significant technological achievements of the 20th century, including the world’s first human-made satellite, and the first man in space. While the US is now the world’s only superpower, Russia has continued to develop innovative technologies and has nurtured five Nobel Prize for Physics winners since 2000. And while the West does not approve, even cursory attention to Russian affairs shows that the Russian people strongly support Putin and his actions in Crimea and Ukraine, probably because they fear political instability on their borders as well as political and economic encroachment by NATO and the European Union. So while of course there will be internal critics and grumblers (because we all have ’em), the claim that Russians are ashamed of their country seems like a rash generalisation to me. When governments act in our name to impose sanctions on a major power like Russia, clearly we need to know more about the country and what makes it tick. But IMO Midnight in Siberia is not the book to help anyone with that. For a different perspective listen to Phillip Adams interview with Greene on Late Night Live or see reviews at the New York Times or Washington Post. *NPR is a public radio station in the US. 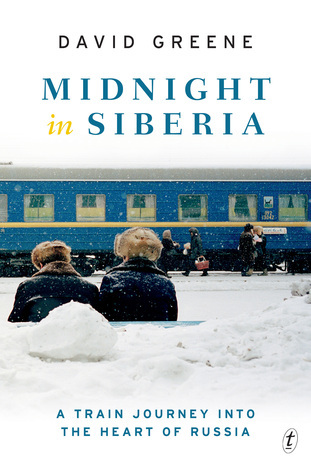 I haven’t read Midnight in Siberia, and so thank you for your honest review and the warning about David Greene’s bias. I am currently living in China and agree with your point that people people living and travelling in other countries should make an effort, no matter how small, to speak the language. I have met expats who have lived in China for two, three, four years, some even longer, and like Greene, they cannot buy a train ticket or order food in a restaurant in Chinese. They rely on others – generally locals with whom they have a ‘friendship’ to take care these things for them. These same people then freely cast criticisms about the people, culture and politics with no attempt at trying to assimilate or understand the perspectives of the people who live in this country. Thank you for going Greene’s bias and highlighting the contributions that Russia has made, and providing a more balanced insight. Thank you, Sonja, I must admit that it’s taken me the best part of a week’s thought and drafting to write this review, alternating between being very critical and then making excuses for the book! Some languages are more difficult than others and I must admit I would find Chinese very challenging, but Russian, once you learn the alphabet is phonetic so it’s manageable. And the people were so helpful once they realised that I was having a go… this has been my experience everywhere, that making a genuine effort with the language and reading up about the background so that you can avoid the worst blunders, has always been treated with generosity and respect. Having read Salisbury book about the siege of Leningrad, l know the Russians can be very proud of some of their history. I and my family visited St. Petersburg in the 1990s, and the Cyrillic nearly floored me. I could not figure out anything. However St Petersburg has one of the world’s great art museums in the Hermitage, and the US has nothing to compare. It’s such a beautiful city, isn’t it? What amazed me more than anything was that the Soviets restored it all, after the Germans trashed so much of places like Peterhof and St Catherine’s Palace on the outskirts. I’d love to go back, it’s like the Louvre and the British Museum, you can’t possibly see it all in one day.